New technology in laser treatment safely and effectively treats spider veins in legs of most skin types. 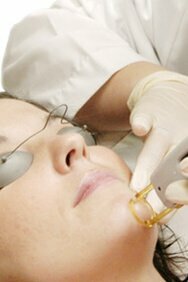 The laser transmits bursts of light onto the vein, which promotes the appearance of the vein to slowly fade. Laser treatment is an appealing option to combat spider veins as it does not use needles or incisions. However, the heat sensation from the laser’s wavelengths may be painful for patients. During the treatment, the technician will also provide cooling which can help reduce the pain from this heat sensation. The length of treatment is typically 15 to 20 minutes long. Depending on the severity of the veins, two to five treatments are generally needed for sufficient outcomes. Patients may return to normal activity immediately post-treatment. For large spider veins (larger than 3 mm), laser therapy may not be a practical option. Experts at Laser Medical Clinic use the Gentle Maxpro Laser System to treat spider veins.There is minimal downtime post-treatment. Patients should ensure the area is protected from sun exposure post-treatment for optimal results. May varicose and spider veins return even after treatment? Current treatments for varicose veins and spider veins have very high success rates compared to traditional surgical treatments. Over a period of years, however, more abnormal veins may develop as there is no known cures for weak vein valves (which causes spider veins). Wearing graduated compression support stockings may help in reducing the speed/frequency of the development of new spider veins.